Route. 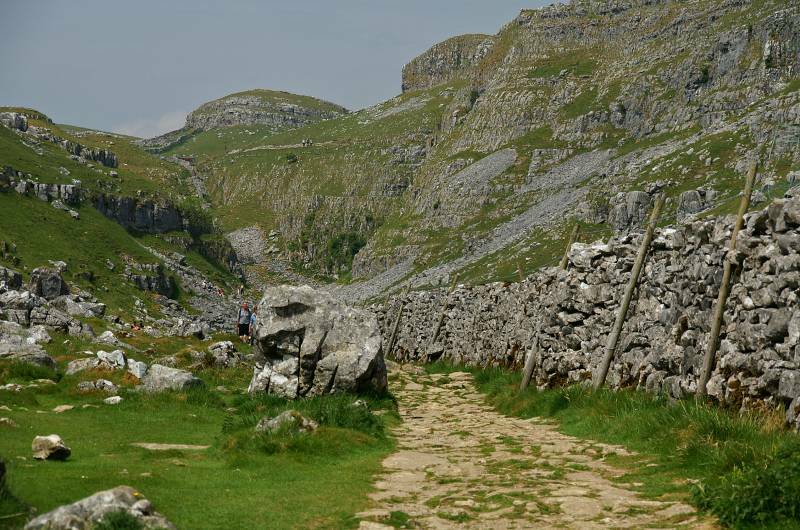 Malham - Janet's Foss - Gordale Scar - Malham Tarn - Pennine Way - Malham Cove - Malham. Notes. 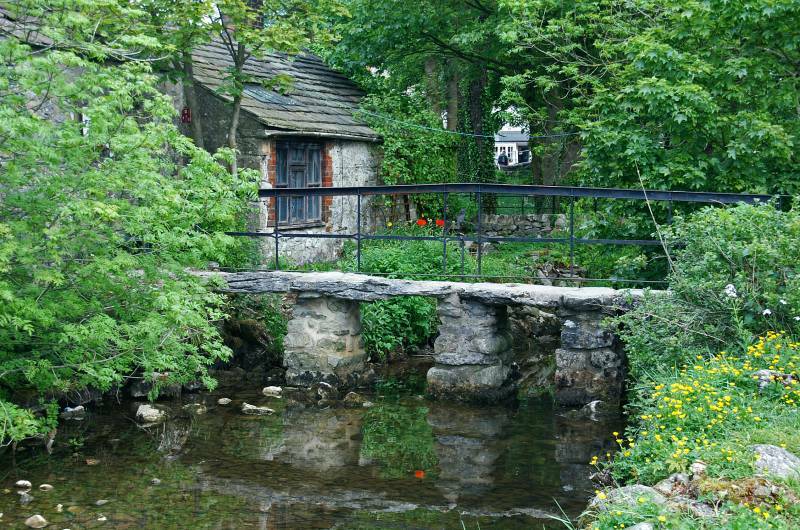 I had Sue for company today, we decided to drive to Malham in the Yorkshire Dales, this tiny Dales village must be one of the most popular places to visit in limestone country, with good reason. 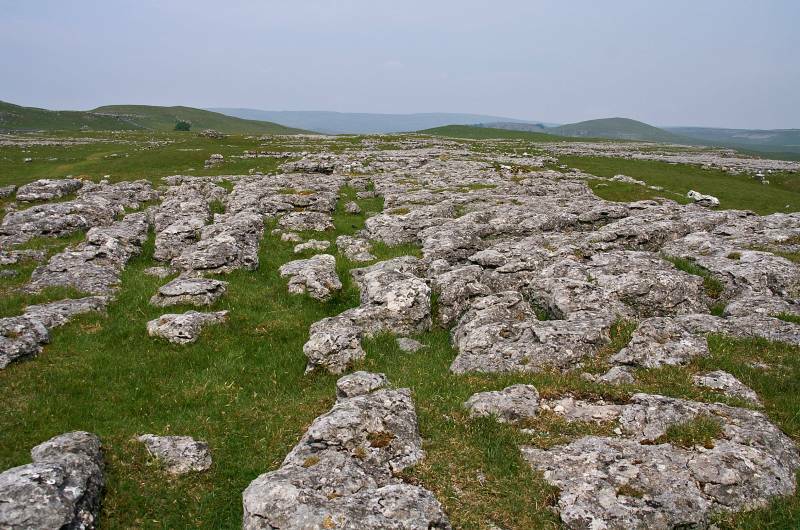 Laying on the Craven Fault the spectacular scenery created by land movement, ice and water is possibly some of the best in the Dales, it's certainly easy access so set off early if you prefer a bit of peace and quiet, we never and had to walk with the crowds. 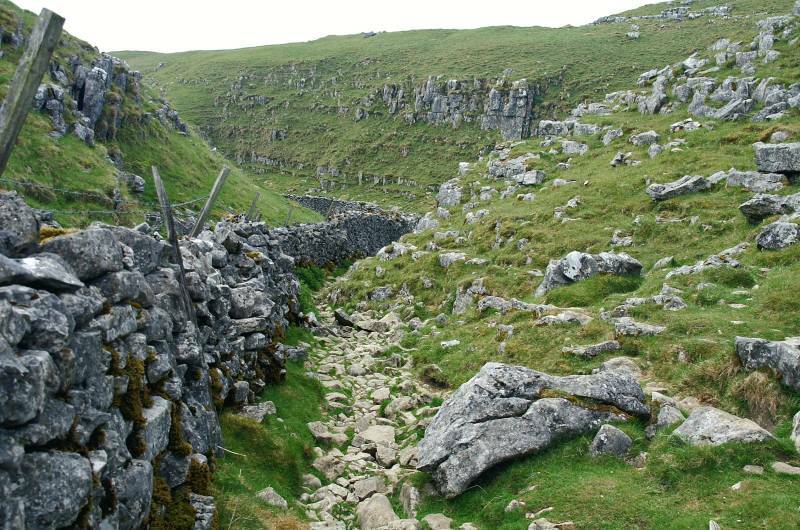 On a hot humid day with the threat of thunder in the air we set out from the Clapper Bridge behind Malham Smithy. On a good path we followed the crowds to Janet's Foss, this usually spectacular waterfall was but a trickle, testament to a long dry start to the year. 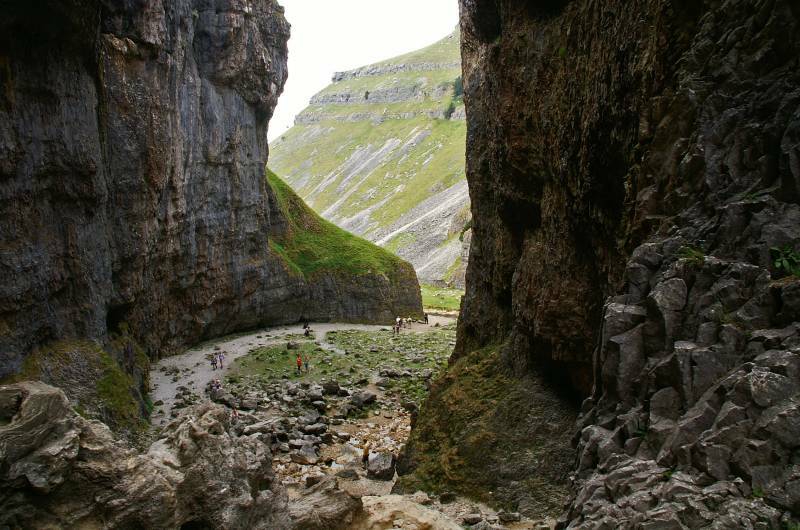 After Janet's Foss we made our way to awe inspiring Gordale Scar, this once giant cavern with walls rising 330ft shear on either side is a must see, even when overrun with visitors. The path ascends a chock stone in the middle of the beck, we ascended into the confines of a high narrow valley before climbing onto the moor, it was a lot quieter up there, not many of the day trippers ascend the waterfall, missing out on some of the best bits. 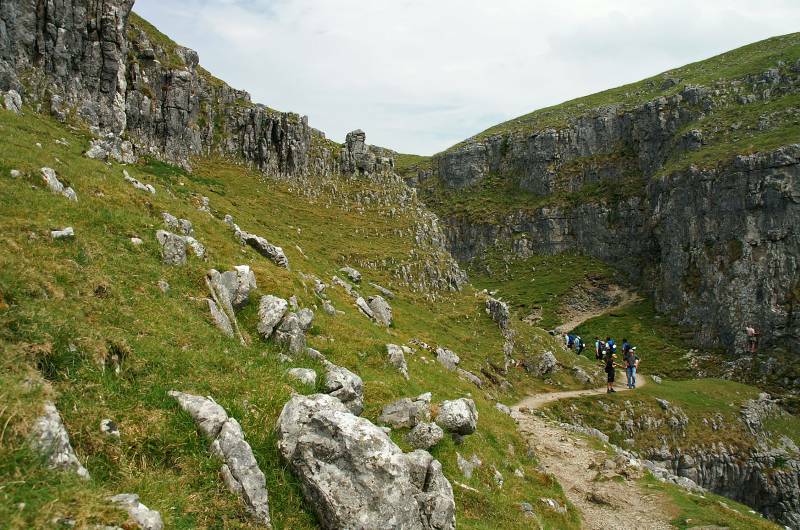 A good path carried us north through some quite splendid limestone scenery before reaching Malham Tarn, it was Malham Tarn that inspired Charles Kingsley to write the classic children's novel The Water Babies. We left the tarn following the stream that drains into Water Sinks, when the water disappeared underground we continued through a wonderful dry valley, this once raging watercourse provides an excellent footpath, we passed between spectacular limestone cliffs, descending long dead waterfalls before stepping onto the limestone pavements above Malham Cove. Our route down started at the western edge of the cove, descending steps polished by many thousands of boots before us, we soon found ourselves standing at the base of the cliff. On a good path it was a short walk back to the village, not forgetting to look back every so often as spectacular Malham Cove got smaller with every step. 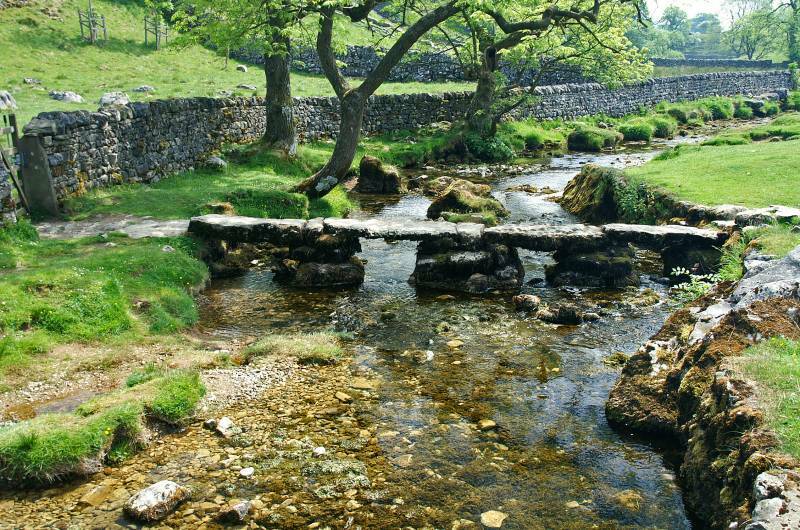 This Clapper Bridge spans Malham Beck to the rear of the Smithy, a good place to start today's little outing. 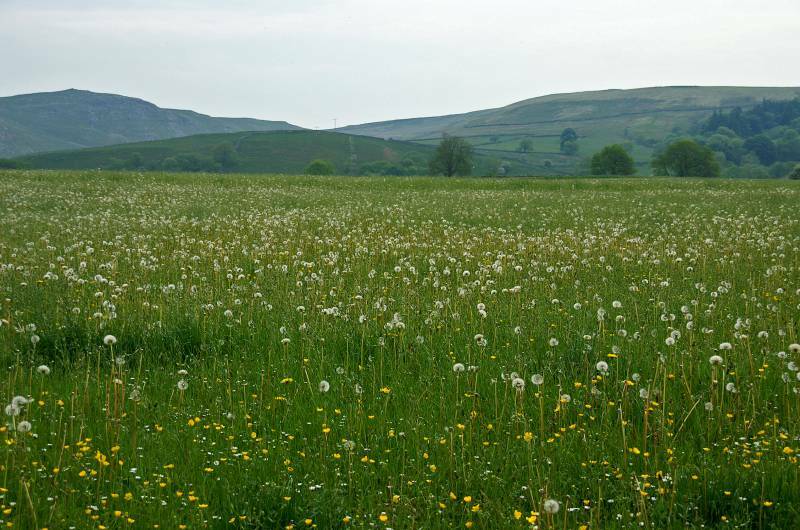 Sue says this is a shot of our back lawn, I think she's dropping hints, it's really a view to the small mound of Cawden backed by Malham Lings and to the right New Close Knotts. 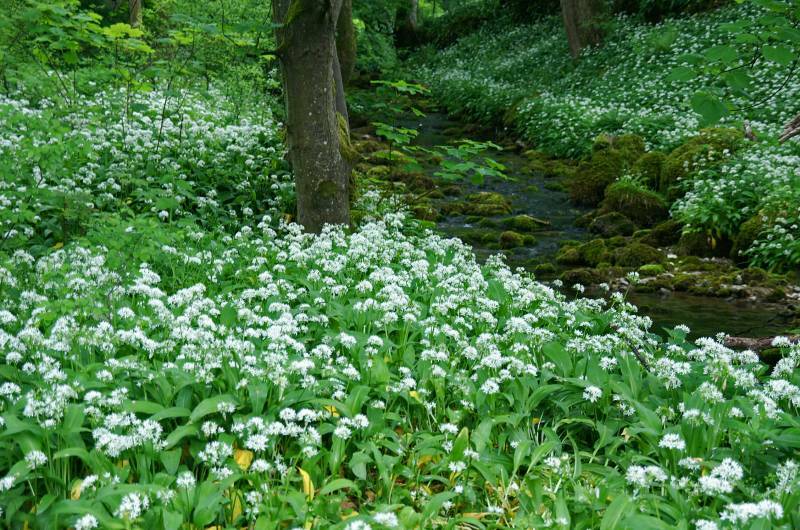 Wood Garlic in Janet's Foss Wood, notice the lack of water in the stream. 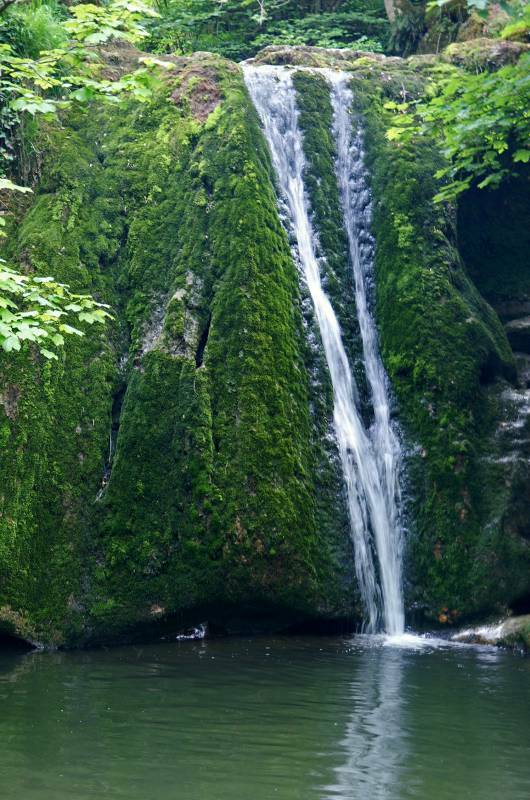 Janet's Foss, hardly enough water to make a splash, folk law tells us the cave to the right, usually hidden by the fall of water is home to Janet Queen of the Fairies. 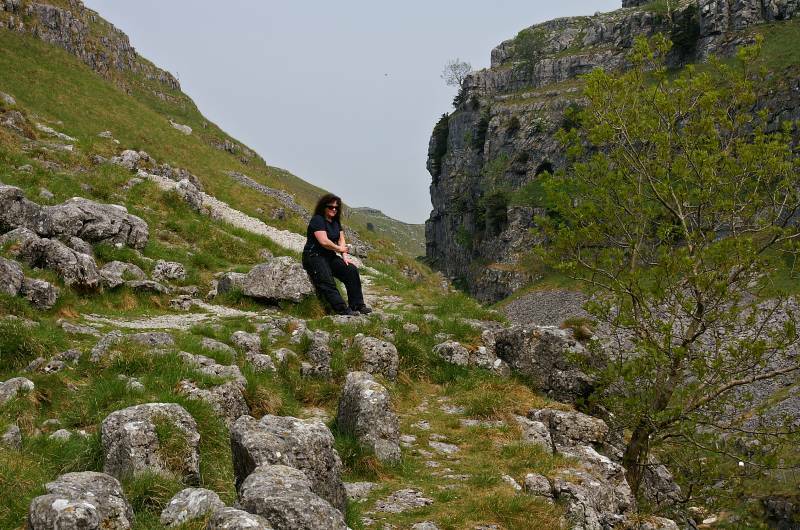 On a grey overcast day not the best picture of Gordale Scar, awe inspiring none the less. We've just ascended the waterfall, note the different coloured boulders, the light brown on the right are usually the stream bed. 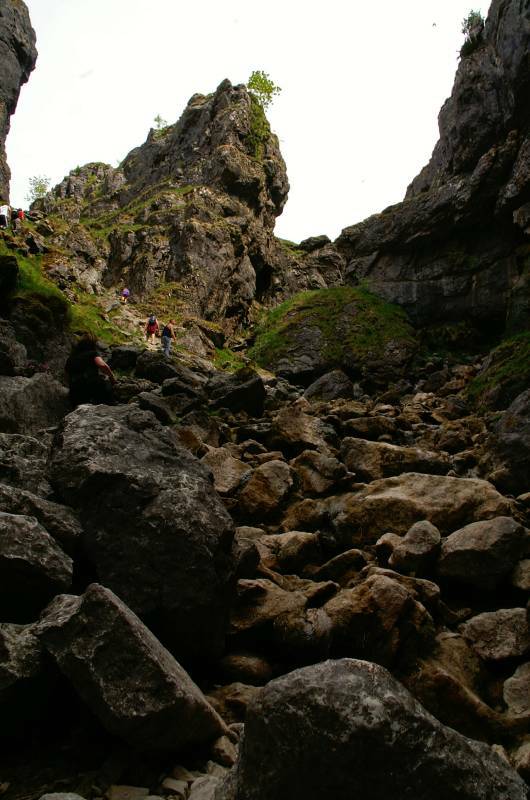 Views to the narrow entrance of Gordale Scar. Sue stops to admire the scenery we've just scrambled through, a short pause for breath before the short sharp climb onto the moors. From the path through New Close views to a distant Fountains Fell. This was our lunch stop, with views back to Gordale. 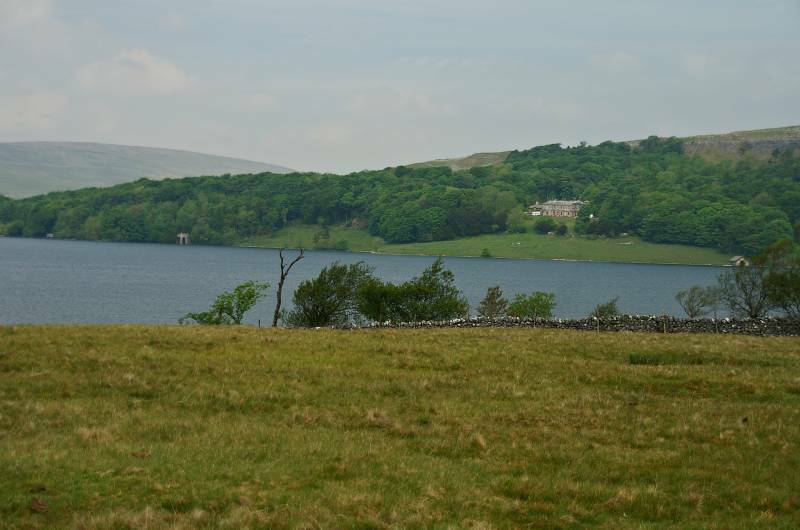 Views over Malham Tarn with Malham Tarn House on the far bank and Fountains Fell top left. 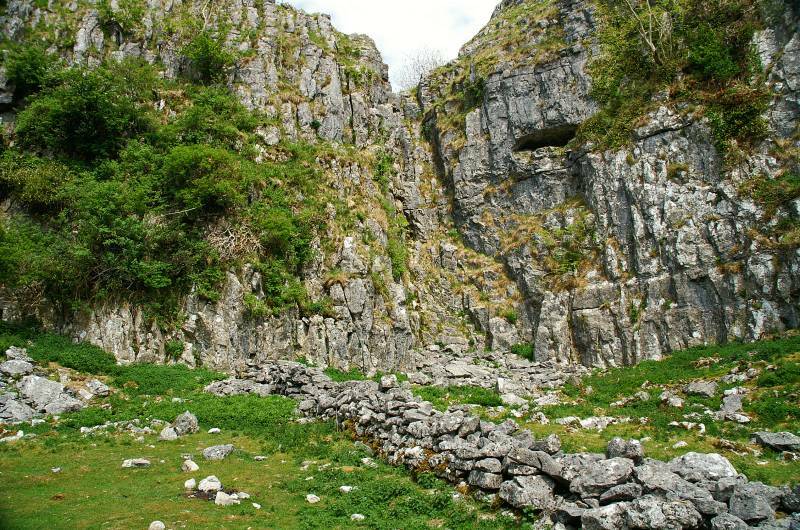 The start of the dry valley, a raging river once cut a path between the limestone cliffs. 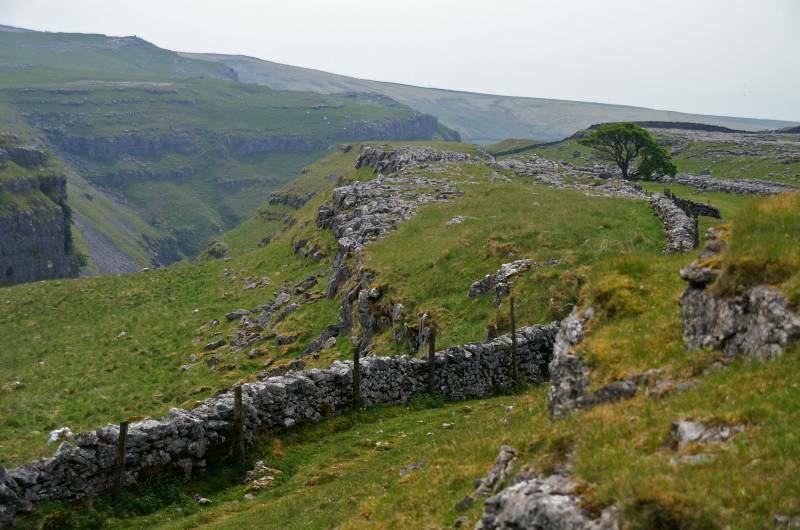 The valley deepens, cutting between the cliffs of Dean Moor Hill and Comb Hill. 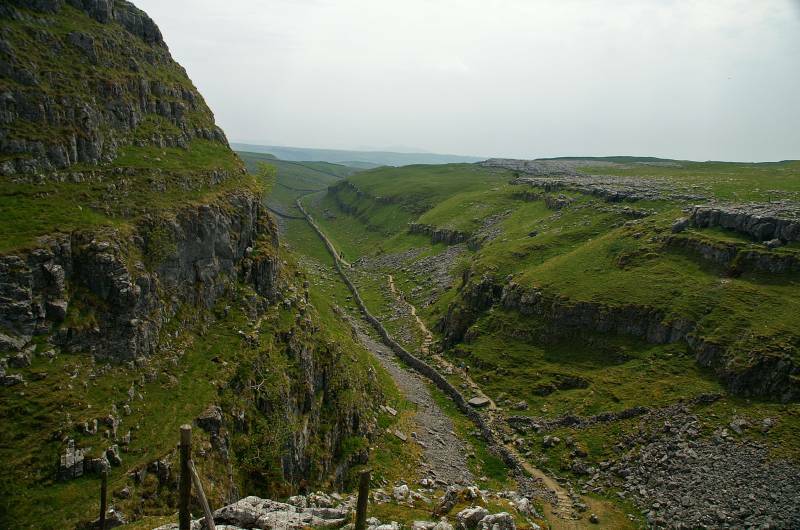 A spectacular view from the lip of a long dead waterfall, Ing Scar to the right of the dry river bed. A rather large party of charity walkers have just broke the silence in this valley that once echoed to the thunder of water. 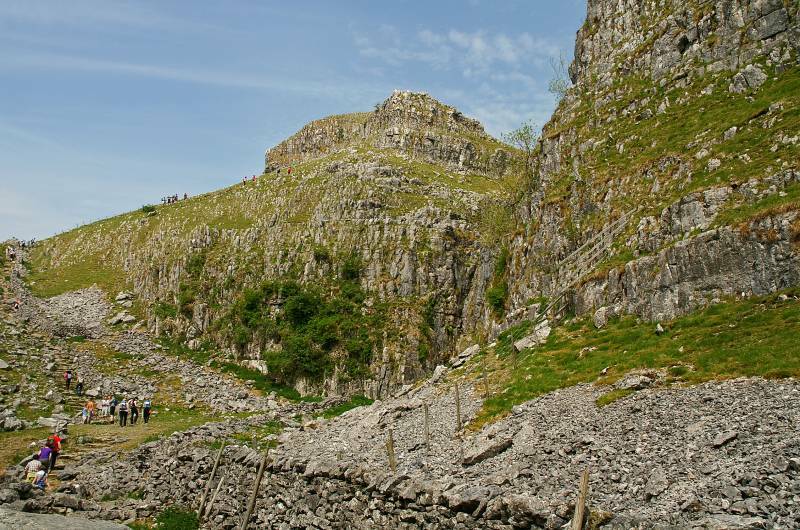 The cliffs of a once large waterfall. 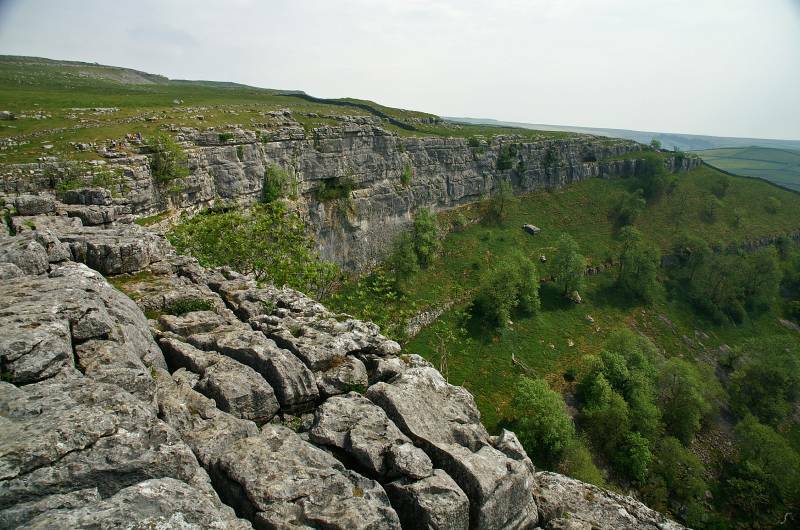 The cliffs of Dean Moor and Comb Hill. 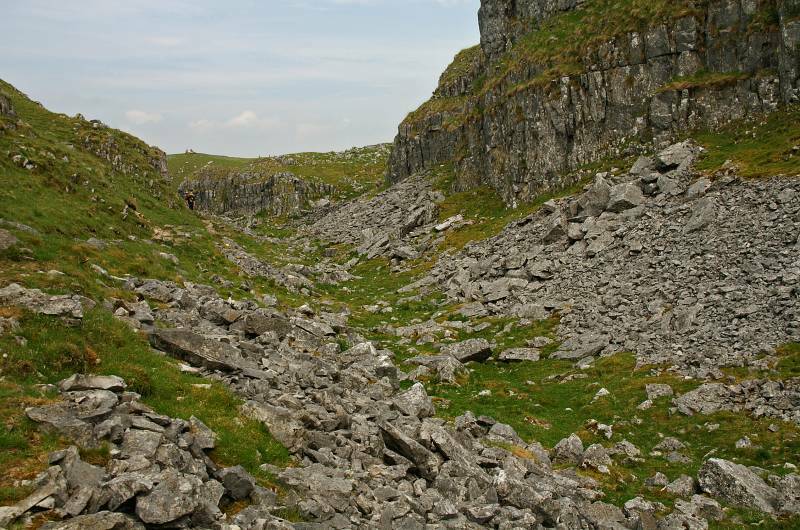 Spectacular limestone scenery in the dry valley above Malham Cove. 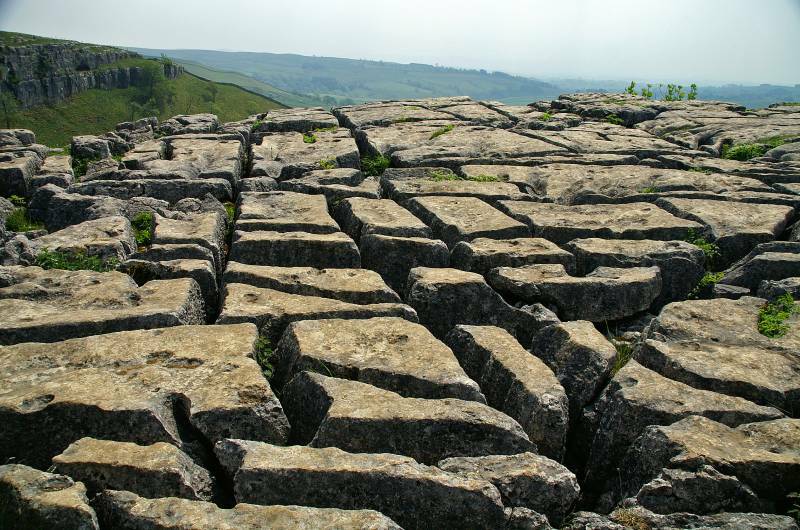 All day we have been walking through a landscape laid down in a warm tropical sea 350 million years ago, we're now on the limestone pavements above Malham Cove about to step over the edge of the Craven Fault. 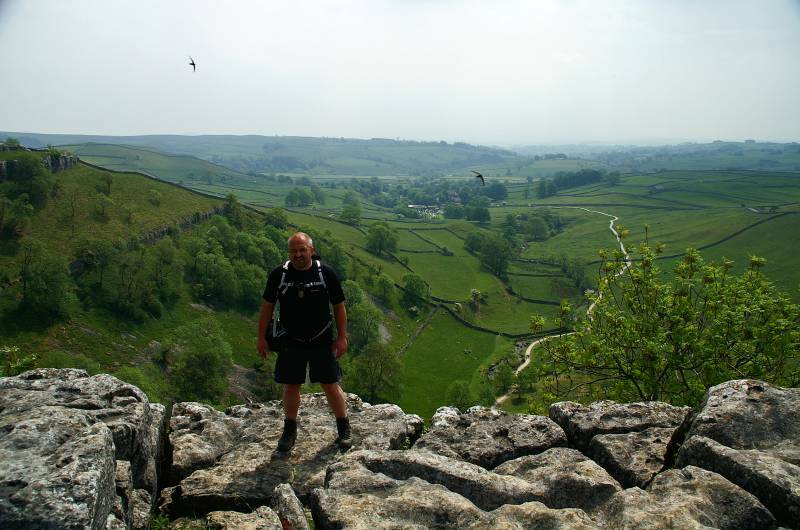 260ft above Malhamdale with a stunting view behind me. 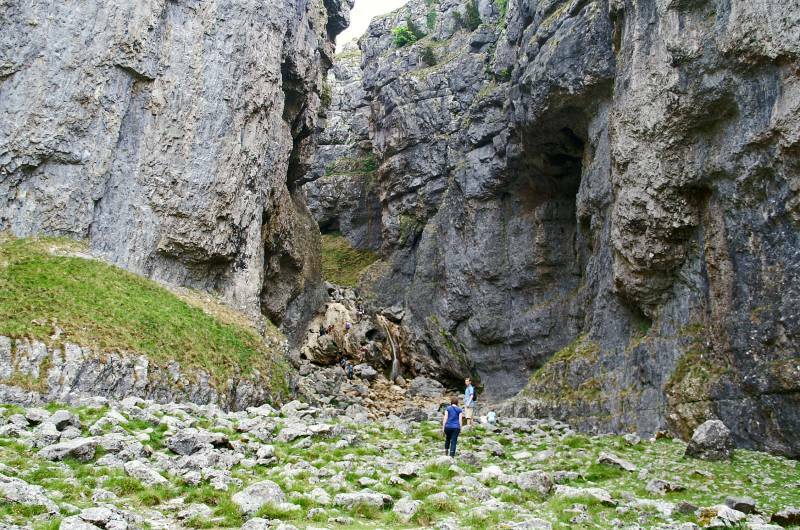 At 1,000ft wide and 260ft high this must be one of the grandest objects in the Yorkshire Dales. 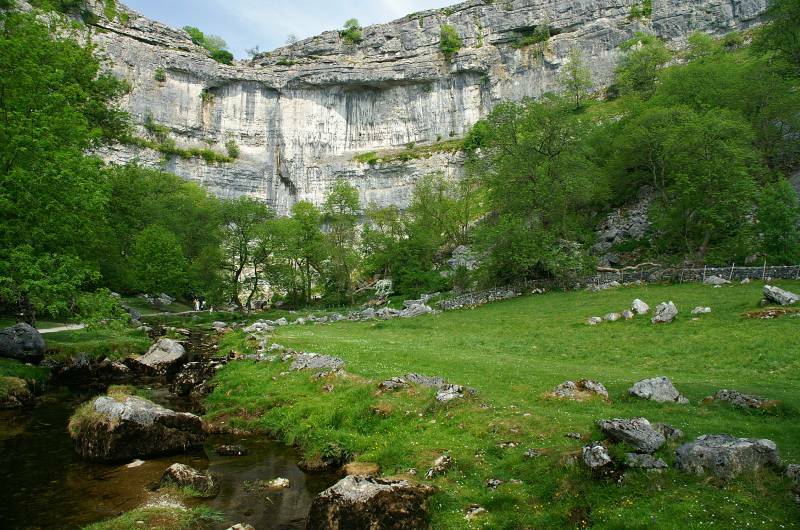 Malham Cove seen from the banks of Malham Beck, for years it was thought this was the stream disappearing underground at Water Sinks, not so, that watercourse emerges into daylight at Aire Head south of Malham. We started the day at one Clapper Bridge why not end it at another, this one is found in the fields below the cove, passed on the way back to Malham.